Hadek’s New Chimney Design is a revolutionary new type of chimney. It consists of a reinforced concrete shell with a PennguardTM lining applied directly to its inside surface. The use of an independent internal flue is eliminated. The design is slender and lightweight, but built to last – even in seismic regions. The New Chimney Design chimney has several advantages compared to a traditional chimney with a reinforced concrete windshield and a separate internal flue. The New Chimney Design is more economical to build, because two expensive items, the internal liner and its supports, have been eliminated. The construction time is shorter; building the chimney consists of slipforming the concrete column directly followed by installation of the PennguardTM chimney lining. The New Chimney Design has lower maintenance requirements, because the chimney flue, the flue supports, insulation and expansion joints have all been eliminated. The New Chimney Design is resistant to a wide range of operating conditions (including FGD operation). The PennguardTM lining is completely acid resistant without limitations for temperature or concentration. The New Chimney Design has greater suitability for seismic regions. The elimination of an internal flue leads to a great reduction in mass, which is favourable when designing a chimney for seismic conditions (see Project Report Colbun & Bocamina Power Stations). New Chimney Design: PennguardTM linings directly applied to the inside surface of a concrete chimney shell. The projects map gives an overview of more than PennguardTM lining installations in new and existing industrial chimneys and ducts onto different substrates such as steel, concrete, brickwork, organic coating and FRP under different operating conditions. The Project Reports highlight specific projects where PennguardTM linings are installed and the challenging technical and environmental demands the projects were facing. When a power station changes over to non-reheated FGD wet stack operation, it is very important to consider the risk of "spitting", which is the emission of droplets with acidic condensate from the top of the chimney. This risk and possible remedies, can be investigated through a Wet Stack Design Study, which models the behavior of droplets in the outlet ducts and industrial chimney downstream of the FGD system. Weld it. Stack it. Line it. - The construction of a very large project like the Sadara chemical complex requires that each and every part is completed reliably, on time, and on budget. This rule also applies to the welding, the erection, and the lining of the six steel chimneys. Once the industrial chimneys were in place, the PennguardTM lining was installed in three steps. To maximize efficiency of the FGD plants, the owner decided to operate wet stack. To protect the steel flues of the industrial chimney against corrosion, they were both lined with a sprayable organic coating. The coating appeared not to be fully resistant to the demanding environment. In 2012 and 2013 Rybnik repaired both flues by installing PennguardTM linings directly over the existing coating, avoiding costly and time consuming repairs. After some 20 years of operation, the steam reheater of Amercentrale 9 had come to an end. The owner then considered the options of replacing the reheater, or converting the chimney to a ‘wet stack’. Not operating a reheater would deliver a significant increase in overall power plant efficiency. Also, sealing the brick flue with PennguardTM was achievable within the already scheduled 31-day outage. Just across the border of Northern Thailand, a consortium of two Thai companies, Banpu Power and Ratchaburi Electricity, along with the Lao Government are constructing one of the world’s largest new mine mouth power stations. The mild steel chimney flues were protected with 18,263 m2 of PennguardTM linings to a high quality standard, on schedule and under challenging conditions. How? State electricity producer Eskom decided to construct two new 4800 MW coal fired Medupi and Kusile power stations to secure the power supply in South Africa. All twelve steel chimney flues were protected with PennguardTM linings. Two experts from TÜV Rheinland visited the Kusile site to perform a safety audit during a large scale PennguardTM installation over a period of several days. Is it safe? To make the industrial chimney suitable for wet stack operation, the contractor has removed the brick flue and its supports, and then installed a PennguardTM lining directly onto the concrete windshield. This design change results in a chimney top diameter of 12.6 m and a very safe gas flow velocity of ca. 11 m/s. No spitting is expected at this low gas velocity. This Project Report shows the modification step-by-step. MPX Energia constructed three coal fired thermal power plants (TPPs) in Brazil with semi dry scrubbers to reduce SO₂. The 67ºC scrubbed flue gas temperature, is well below the sulphuric acid dewpoint. Consequently, the internal surfaces of the industrial chimneys must be resistant to sulphuric acid condensate. The owner chose New Chimney Design (NCD) chimneys, to achieve both low construction cost and long term durability. PennguardTM lining: installation in new concrete chimneys, on concrete shell directly (New Chimney Design). PennguardTM lining: installation in new concrete chimney, on concrete shell directly (New Chimney Design). As the existing chimneys were not suitable for wet stack operation, the owner decided to construct two PennguardTM lined concrete chimneys (New Chimney Design). Even though two industrial chimneys seemed more expensive than one twin flue chimney, the cost of two chimneys could be kept low, by applying the PennguardTM lining directly to a slender concrete shell, avoiding the use of internal flues. PennguardTM lining: installed in 2 new concrete chimneys, on concrete shell directly (New Chimney Design). Flue gas treatment: wet limestone FGD. Flue gas: desulfurized, non-reheated 67°C (wet stack). To protect the steel chimney flues against the very corrosive and variable operating regime, PennguardTM linings were applied over their full height. In total, the three steel chimney flues use 13,037 m2 of PennguardTM linings. 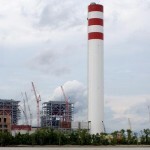 The builders of the Tanjung Bin chimney (BEC) chose for pre-lined cans and bolted flanges. More information for your specific project? Both Colbun and Bocamina power stations have ‘New Chimney Design’ (NCD) chimneys, protected by lightweight, insulating PennguardTM linings applied directly to its inside concrete surface. NCD chimneys are lighter than conventional chimneys with internal flues. This makes the design safer during earthquakes. This Project Report describes the NCD chimneys in strong earthquakes in theory and in practice. One significant decision was to place the required booster fans downstream, rather than upstream of the FGD absorbers. The second decision was to use PennguardTM lined concrete chimneys (New Chimney Design), to lower the construction cost compared to traditional chimneys and to minimize the condensate formation within the wet stacks. Owners expect near 100% availability from every component of their plant, including the industrial chimney lining. The steel flues of the two Quang Ninh Power Station chimneys have been lined with 331,200 pieces of PennguardTM Block. To meet the owner’s expectations, the production, engineering and installation of the PennguardTM lining system followed a rigorous step-by-step quality control process. PennguardTM lining: installation in new concrete chimney with two steel flues. Flue gas: desulfurized, reheated to 80°C. The East Kentucky Power Cooperative (EKPC) produces electricity for 16 regional power cooperatives, which between them serve one million consumers in 89 counties. The Spurlock Power Station near Maysville, Kentucky is EKPC’s largest power station. Spurlock station has completed two wet limestone flue gas desulphurization (FGD) systems, each with a new, PennguardTM lined chimney. Due to the FGD retrofit, the flue gas temperature would drop well below its acid dewpoint, resulting the need to protect the unprotected steel flues with a chimney flue lining system. CLP Power decided to install PennguardTM linings within scheduled outage times only. More than just being quick, the work would have to result in a lining service life exceeding 20 years, without significant maintenance or repair. Ever since the introduction of FGD plants, owners have decided to re-use their existing, brick lined chimneys for low temperature, acid condensing operation. Brick flues have been prepared for aggressive FGD operating conditions in various ways and PennguardTM linings have proven to be the most effective, durable technology. Why? RWE npower decided to fit Sea Water Flue Gas Desulfurization (FGD) at Aberthaw power station based on more stringent SO₂ emissions regulations. This would have consequence for the existing 40 year old brick flue chimney. This Project Report describes the industrial chimney modification process in a step-by-step process and explains in detail how a PennguardTM lining protects a brick flue from thermal stress. For environmentally safe operation of the wet stack, EDF Energy contracted Alden Research Laboratory, to study the options for the outlet ducts and the industrial chimney flues. Based on the consultant’s recommendations, the existing chimney was modified by removing the brick linings from the 4 concrete flues and by protecting the inner concrete surface with PennguardTM linings directly. How? Click on read more. To convert Coleson Cove station into a low cost generator, NB Power decided to make the station suitable for firing Orimulsion and to operate wet stack. For this, a new chimney with two PennguardTM lined steel flues was constructed. The Project Report also describes how insulating PennguardTM linings will help to reduce condensate formation within wet stacks during start-ups. A technical survey of the chimney showed that the concrete shell and the brick lining supports were under attack from sulphuric acid condensate. Also, thermal cycling had created wide cracks in the concrete windshield. Any further deterioration of the industrial chimney would be an unacceptable risk, also considering the earthquake risk. This Project Report describes the chimney refurbishment project. An increasing number of coal fired power stations are experiencing frequent start-ups and shutdowns as they have to follow the demands of a free electricity market. West Burton Power Station is a good example; outside of the winter season, it often operates on a “two-shift” schedule, starting its 500 MW units every morning and stopping them every night. This cycling operating schedule creates many challenges for the station. Before the introduction of FGD, the standard chimney design for KEPCO’s coal fired power stations was a 150m high concrete chimney, protected internally with a sectional ceramic brick liner. The addition of FGD absorbers to all six units would create a technical problem for the old chimney design. The customer chose PennguardTM linings in 6 concrete industrial chimneys in 3 different ways. PennguardTM lining: installed in two existing concrete chimneys with brick chimney liner. Flue gas treatment: wet FGD with gas-gas-reheat. 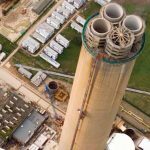 For the 200m high reinforced concrete chimney with two 4.5m diameter steel flues, the contractor decided to line the 7.2m high steel cans with PennguardTM on ground level first. Then, the pre-lined cans were placed inside the industrial chimney and welded to the flue. The chosen work method proved to be fast and efficient. The PennguardTM lined flues were installed within 8 weeks. The FGD outlet ducts are exposed to highly corrosive operating conditions and sometimes to a total or partial FGD bypass of the unscrubbed gas stream. The PennguardTM Block Lining System was chosen for the internal protection of the three large FGD outlet ducts. After mounting the three large outlet ducts onto their support construction, the PennguardTM lining installation followed. During the selection of a suitable lining for the steel chimney flues, it became clear that the Sual project presented several specific challenges. The main points of consideration were the chemical environment in the flues, the seismic activity of the region and the adverse local climate conditions. In 1996, it was discovered that the lower part of the internal brick liner of the Unit 9 industrial chimney was under attack by highly acidic flue gas condensate. This condensate was permeating the brick liner and threatening to attack the concrete support structure. An impermeable PennguardTM lining was installed directly onto the brick flue surface to prevent further leaking. Click on Read More, for details. 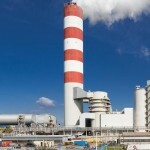 6 x 220 MW heavy oil fired Dunamenti Power Station had a problem in its industrial chimneys. The station had two 200m high chimneys, each with three internal steel flues. Even though the gas temperature was 150 – 160°C, the steel flues were under strong acid attack, especially around ‘cold spots’. In order to solve the problem, the steel flues were repaired and partially relined with the PennguardTM Block Lining System. Flue gas treatment: sea water FGD / bypass reheat. PennguardTM lining: installation in new concrete chimneys with two steel flues. Flue gas: desulfurized, reheated 60-72°C. 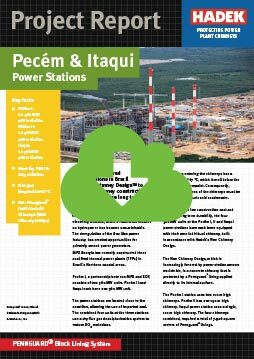 Three new coal fired power stations in Brazil use New Chimney DesignTM to minimize chimney construction cost and maximize long term reliability. 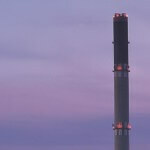 Want to see more Project Reports of our protection of industrial chimneys? Pennguard™ is a registered trademark of Ergon Asphalt & Emulsions, Inc.